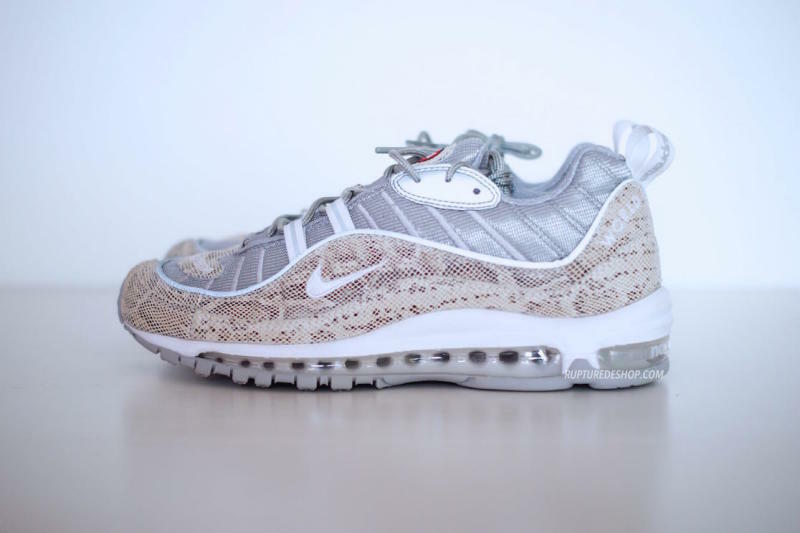 The Supreme x Nike Air Max 98 looks to be the newest collaboration between both skateshop Supreme and Nike Sportswear for another limited release. Using the Nike Air Max 98 as the silhouette, which was a model that returned in several new colorways last year. Supreme has plans to bring back the classic model in two colorways – which are the only two that have surfaced thus far. Both pairs are built using snakeskin throughout the upper, reflective piping, and Supreme branding on the toe, heel tab and heel. As of right now there is no exact release date set, but check out the first set of images below and stay tuned to Sneaker Bar for more updates on the Supreme Nike Air Max 98 collaboration as it develops. UPDATE: The Supreme x Nike Air Max 98 Collection to release on Thursday, April 28th online, followed by a Japan release on April 29th. NikeLab locations will be releasing their pairs on April 30th. The retail price tag is set at $175 USD. The sneakers and the hats will not release at Supreme stores in New York, Los Angeles, London and Paris. UPDATE: There is now a “Red” and “Navy” pair added to the upcoming Supreme x Nike Air Max 98 collaboration via @hichem.og. Still no release details at the moment, or which colorways will actually be added to the retail collection. UPDATE: Detailed images of both Supreme x Nike Air Max 98 colorways via Complex and from Rupture. UPDATE: Here are a few on-feet images of both Supreme x Nike Air Max 98 colorways via @dabestsneaker. UPDATE: Following a first look, we now get a few more images via @sneakermaniastore of both upcoming Supreme x Nike Air Max 98 colorways.